Counter Top Popcorn Machine Made by Star Brand New $600 call 770-925-4858 for shipping quote. Single Phase. 110 volts. Used. 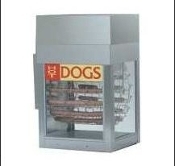 Roundup Hot Dog Cooker works good 115 Volts $300 call 770-925-4858 for shipping quote. Star Hot Dog Roller, 24 inch, 115 volt, works good, $300 w/o sneeze guard, $375 with sneeze guard, call 770.925.4858 for shipping quote.